Happy Spring everyone! The equinox has passed, the days are now officially longer than the nights, and that fact is heightened by daylight savings time beginning. In addition to the artificial act of setting our clocks forward, nature's clock tells us the seasons are turning. Bulbs are sprouting in Bryant Park's flower beds, as colorful rows of crocuses, hyacinths and daffodils are brightening the park. Gabriel, in the blue shirt on the left, leads the tours. Another sign of spring is the return of our seasonal birding walks in Bryant Park that are timed to coincide with the fall and spring migration seasons. They are twice-weekly: Monday mornings from 8-9am and Thursday evenings from 5-6pm, to allow midtown commuters to join the walks either before or after work - they're a great way to start or end the workday, strolling the park and searching for the incredible diversity of birds that stop by during migration to rest and refuel. The earliest migratory species are already arriving. Some of the first birds to pass through our region in Spring (usually right around the equinox) are Red-winged Blackbirds, Eastern Phoebes, and American Woodcocks. The latter species, a comical-looking relative of snipes, with a long bill designed to probe moist soil for worms, makes annual appearances in the park, most commonly in early spring. Several have already been seen, resting or walking quietly in flower beds in search of worms and a quiet spot to sleep during the day (they are nocturnal birds). Occasionally, woodcocks collide with the windows of high-rises when they are migrating through the imposing city environment. This past fall, we actually witnessed such a collision right next to the park during a walk, and were able to intercept the injured bird and bring it to a wildlife rehabilitator uptown, where it was nursed back to health and eventually released. 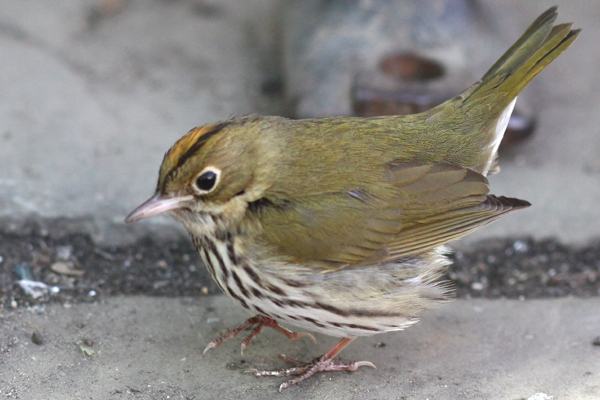 An Ovenbird scrambles across the bluestone. As the season progresses, it will bring waves of different bird species to our region: after the phoebes and woodcocks come sparrows such as Chipping Sparrow and Song Sparrow (which occasionally overwinter as well), House Wrens and Ruby-crowned Kinglets, and early-migrant warblers like Common Yellowthroats and Ovenbirds. Later in the Spring, many more warbler species will arrive (over 30 species of warbler have been spotted in Bryant Park to date! ), as well as colorful tanagers and orioles, and more subdued vireos and thrushes. In spite of the tiny size of Bryant Park, its rows of plane trees and flower beds are often alive with an amazing diversity of bird species (121 species recorded in the park thus far). One of my favorite aspects of the Bryant Park walks is the opportunity to observe the migration through the season, from mid-April until the end of May. I hope you will join us as well, whether on the morning walks the evening walks or both, to witness this incredible spectacle for yourself!